Do you know how to find a list of companies offering current vacancies? Use CareersLink – click on the vacancies tab. These companies have specifically advertised with us to target YOU University of Manchester Students. Use graduate recruitment directories available in the Careers Centre to take away. Most arrive in September but stocks are available most of the year. Use sector specific vacancy sites and press. Use our sector pages to become familiar with the best ones. Do you know how to find a list of companies for any particular sector you may be interested in? 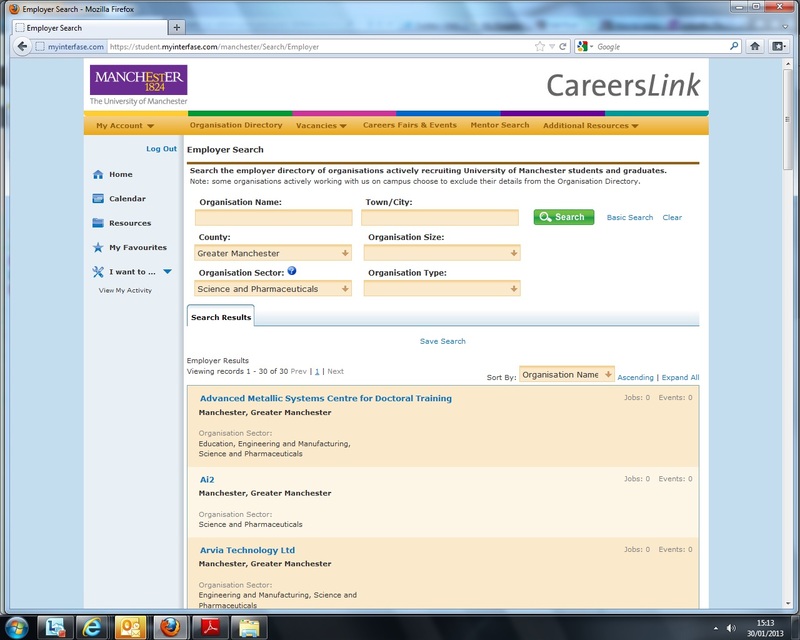 Have you used the organisation directory in CareersLink? A company registering an event or vacancy can choose to appear in the directory. So even if they have no vacancies currently advertised with us their website will be listed so that you can search for them, why not search by organisation sector in the advanced search option. Use the sector pages there are often links to portal sites where you can find lists of organisations by sector. On some of our NW pages we have even done the hard work for you and there are downloadable lists. Use the Careers Centre – we have books and journals that can not be accessed online. Use our starting point guides. Ask the information staff – based in the Careers Centre. The information team have many years of research skills – they can point you in the right direction. If in doubt google it! But be prepared to be persistent and keep refining your search terms. Not every result will be relevant or reliable! Ok so now you have a list and you have to start making choices and be able to articulate why you want to work for RBS not HSBC, Exxon not BP? Often when looking at graduate directories or graduate scheme websites one looks pretty much like another. You may indeed be applying to 6 investment banks but don’t make the mistake of writing a generic CV or cover letter. You may just want a well-paid stable job and are not that fussed about what you do for your first graduate job, but for heaven’s sake don’t put that on your application! You must show the employer why you have chosen them and how you fit into their organisation. Are the roles you are applying for the same or very similar or do they actually have unique characteristics in different companies? What about progress beyond the graduate scheme is it the same, what are your options to specialise? What is different about the companies? 1 You can research this on most company’s websites (ignore the graduate / get a job with us bit for now). Imagine you wanted a broker, a new bank, advice on your business, a new app designing, to buy a product etc. How would you choose between the companies on offer? Different ethos, how do they perceive themselves what is their USP? Different geographical coverage, local, UK, EU, Global, emerging markets? 2 You can also find out what is being said about them in the media, (news articles, social media, advertising campaigns) any recent publicity good or bad. Evaluate how this will impact on the company and how that might influence your decision to join them. 3 Did you go to one of their events, meet a representative? What did they do that made a positive impression on you? 4 There are lots of websites now where you can get employee profiles and tips on what different companies are like to work for. Just bear in mind the context, ex-employees may have something different to say to a current employee, something that’s anonymous may be different to something endorsed by the company. e.g. Have any of your friends or family worked for any of the organisations you might be interested in? Have you set up a LinkedIn profile? Check out our guide on how to use LinkedIn effectively. So now you have the basics, there are no shortcuts unfortunately, but it does get easier as you become familiar with the best sources of information. Use the ‘Advanced Search’ in the CareersLink Organisation Directory to narrow your search by organisation size. You can combine this with sector and/or location too.